Biolage R.A.W. Recover Conditioner is rated 3.8 out of 5 by 11. 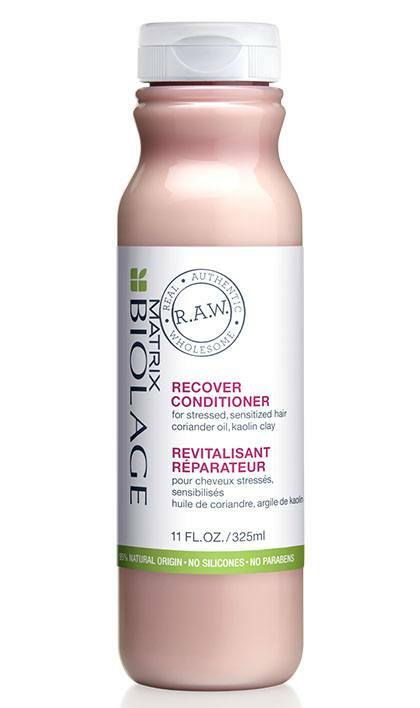 Share https://www.matrix.com/biolage/raw/raw-products/recover/raw-recover-conditioner R.A.W. Recover Conditioner for Damaged Hairhttps://www.matrix.com/~/media/images/haircare/biolage/raw/2018/biolage_raw_recover_conditioner.jpg Conditioner that helps restore stressed, sensitized hair for improved strength, shine and bounce. Rated 1 out of 5 by lizzzzz from rats nest I have been using Biolage for years. In the last year I have tried going to a less chemical based lifestyle and with it went my biolage. I was thrilled when they came out with raw and have been very disappointed. The shampoo seems fine, but the conditioner is another story. I have long, thick hair and what use to come out of the shower straight and not even require a comb now is a dried out rats nest. To the point of my 30 something year old self in tears trying for 20 minutes trying to get the knots out. Why cant they make a product that ditches the cancer causing chemicals and it actually work? Rated 2 out of 5 by Kaseybay from Read all the reviews I wish I had read all the reviews before buying this product. I bought it online and it works fine, my hair feels good. But I read all these reviews saying how great it smells and didn’t read far enough down that it actually smells like men’s cologne. I know some people like that smell but I do not. And it’s a strong smell that lingers, I can smell it all day. Maybe it’s a smell that just bothers me though because I feel like I reek of it and my husband says he can’t smell it at all on me. So I have a big bottle that I can’t really use. I just want people reading how great it smells to be aware the smell is a strong men’s cologne. Rated 5 out of 5 by KatieN from Smells Great! I love this conditioner. It not only smells clean, it works to make my hair soft without weighing it down. Rated 5 out of 5 by mea8an from Smells like heaven I used this on vacation as I forgot mine and borrowed from a cousin. Went and bought the trial size and loved the results even more after a couple weeks use. Shampoo is thin / watery and not a ton of suds - which I prefer - just need to have your hair very wet to get it distributed but cleans wonderfully without stripping. The conditioner is amazing, the best smelling conditioner I have ever used. Leaves my hair soft, helps with winter static but does not weigh it down. Rated 5 out of 5 by Mickey from Superb cleanse and great shine I purchased a trial size of the shampoo and conditioner from my hair stylist. I immediately loved the results! My hair was shiny and lightweight and the smell is amazing. I have now purchased the 33 oz bottles of each because im so happy with the results! Rated 4 out of 5 by Sheryl30 from What IS the fragrance? I love the fragrance so much I went looking for coriander oil to see if that was it. Definitely not! Ingredients only say "fragrance" but can you share what it's made of? I'd love a body spray or perfume that smells the same! The conditioner is nice, overall. Not amazing for long hair like mine but not bad. Rated 5 out of 5 by KJM74 from Love the fragrance of this condition Lovely conditioner. I provides enough moisture but I dont find it too heavy. Its fragrance is simply gorgeous! Rated 5 out of 5 by Stormy from Awesome product I love this conditioner!! It is super nourishing and rich. Leaves your hair soft but not flat. Finally found the conditioner I've been searching for.